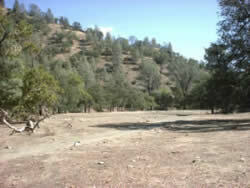 Camp Isom is a 160 acre primitive camp located along Orestimba Creek in the Coast Range, nine miles west of Newman. It is 10 miles south of the Diablo Grande Golf Courses and is situated at the bottom of a steep canyon with a seasonally flowing creek running through it. The landscape is dotted with pine, oak, and sycamore trees, and in the spring beautiful wildflowers pop up everywhere. A variety of animals are regularly seen wandering through the area such as deer, wild pig, quail, turkeys, rattlesnakes, squirrels, coyotes, and mountain lions along with many other creatures large and small. One prominent feature of Camp Isom is a permanent spring that empties into a series of three ponds in which fish and water lilies abound. 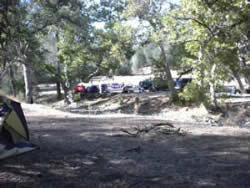 The camp is three miles by air and six miles hiking from Henry Coe State Park. In the past Scouts have hiked from Isom over to Coe Park and exited to Morgan Hill. This is a true wilderness experience. This should be treated as a primitive campground and campers must haul out all trash. There is an outhouse located at the camp. The roads are dirt and should not be attempted unless there has been at least seven days without rain. The soil is clay and impassable even by 4-wheel drive vehicles after a rainstorm, as the road is very steep. Pickups and 4-wheel drive vehicles are recommended, as the road is rough in places but well maintained for back road travel. There are two campsites near the creek. Bring all you need to set up a primitive campsite, including water and wood. Make reservations at the Scout Office in Modesto.